The title of this concert is partly derived from Stichting Nauwluisterendheid ('Narrow Listeningness' Foundation), founded in 1960 by Professor Adriaan Fokker, which in 1967 changed its name permanently to Huygens-Fokker Foundation. With the odd term 'nauwluisterendheid', Fokker was referring to the small intervals of the 31-tone system, but also to the ability of the audience to listen very carefully to the microtones of this tuning. 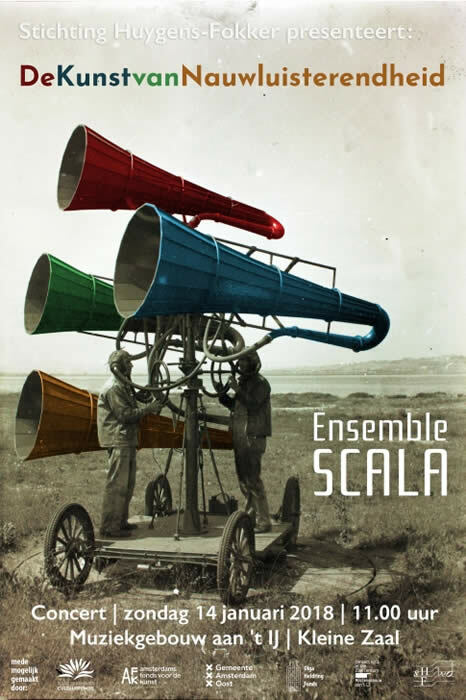 To Ensemble SCALA the task to perform music with these sounds, so the audience can master the art of 'narrow listening'. The program includes new works by the Dutch composer Arnold Marinissen (1966) and the Finnish composer Juhani Nuorvala (1961). In between the fascinating piece Zerscheinen by the German composer Steffen Krebber and last but not least a performance of the beautiful post-minimal composition Aleph 2 by the famous American composer Terry Riley. Rapprochement: (especially in international affairs) an establishment or resumption of harmonious relations / a work for microtonal ensemble by Arnold Marinissen, written for Ensemble SCALA / Stichting Huygens-Fokker. The core quartet of Marinissen’s Rapprochement consists of Carrillo piano, Fokker organ, meantone guitar, percussion; four instruments, each with its own highly individual world of tuning and intonation. The Carrillo piano, with its extremely fine tuning of 96 notes in an octave, offers a microscopic view on the inside of one octave. The 31 tones within the octave of the Fokker organ cater well for just intonation, and at the same time offer a rather distinct intonational flavour. The meantone guitar of Ensemble SCALA’s guitarist Stefan Gerritsen uses a selection of pitches from the Huygens-Fokker scale, allowing for enharmonic differentiation in most keys. Percussion, a family of instruments rather than an instrument, offers tunings that range from well-tempered to voluptuously rich, harmonically chaotic, fuzzy to the point of unrecognizable, or even completely random. Marinissen gives each of the core instruments the space to speak for itself, in its own intonational language - at the same time inviting it to have a tranquil conversation with the others. Although Rapprochement can be performed by the core quartet only, Marinissen composed two so- called shadow parts which allow a number of players to join in, mingle and parrot. The shadow players discreetly follow and double the core players, copy as well as they can their intonation and timing, and thus provide the core quartet with a a subtle and flexible instrumentation - a musical shadow. The composition was supported by the Fonds Podiumkunsten. This concert is made possible by the support of: Prins Bernhard Cultuurfonds, Amsterdams Fonds voor de Kunst, Olga Heldring Foundation, Gemeente Amsterdam (district East) and Stichting Fonds voor de Geld- en Effectenhandel.